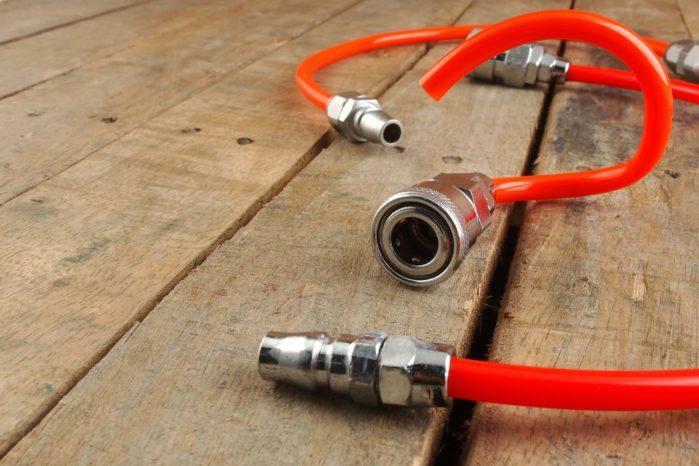 Air hoses are an essential tool in any industrial workplace. Be it in mechanical engineering, civil engineering, architecture, or automotive, these hoses have important uses. One of the most common applications of an air hose is to deliver compressed air. Thus, the best air hose needs to be solidly built and durable. Compressed air is not a laughing matter, and it can get dangerous. Hence, it should be in our best interests to think carefully before buying an air hose. Today, we’ll give you all you need when purchasing an air hose, so stay tuned for more! The idea of an air hose is pretty simple, and it’s not much of a difference compared to other tube types. 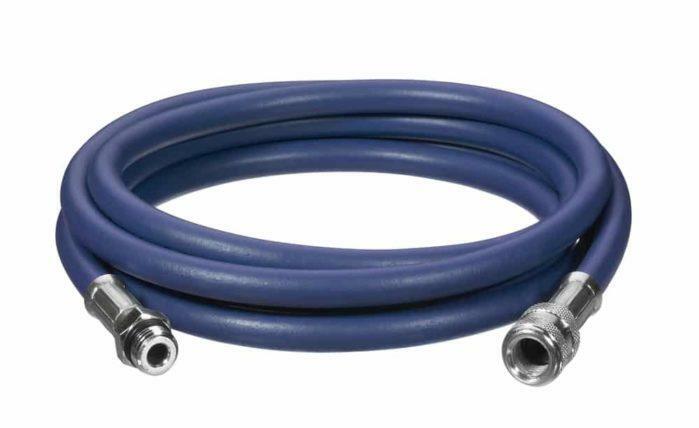 Similar to a garden hose, an air hose connects to another equipment that releases a substance. As we’re all familiar, garden hoses are usually connected to faucets to allow the passage of water. With an air hose, it typically links to an air compressor. The air compressor generates the compressed air that runs through the air hose. Since compressed air is a lot harder to deal with that running water, the fittings of the air hose, as well as its material, needs more attention. Running water is easy to handle because it’s typically harmless. However, compressed air can be lethal enough to inflict external wounds in the workplace. 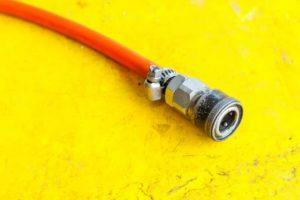 That is why the fittings, particularly the nozzle of the hose, must be scrutinized. It is where the air comes out, and it’s when it bursts further. A good tip here is the better the material used in the fittings, the better. Before diving into our top-five picks, it is better to know the basics on choosing an air hose. This way, you’ll be on the lookout for the factors that can affect the performance and durability of your air hose. There’s no secret that air hose manufacturers face a lot of pressure in constructing their products. A fundamental mistake in the construction and design can lead to injuries that we wish to avoid. With that said, always start by looking into well-established brands that produce industrial tools. If you encounter an up and coming brand or one that is relatively new, try to research well and check the reviews. Always be on the lookout regarding the material that the company has used. Famous materials that you use for the hose body itself are polyurethane and rubber. These two elements make for a great combination of lightness, elasticity, and durability. With that said, it’s important for you to remember that the material should also be easy to lift and ergonomic to use. As for the fittings, aluminum is an excellent option because of its durability and smooth sheen. Try to feel both the hose and the fittings if they are firm and smooth. These are good indicators of a durable air hose. Length is a factor that’s usually dependent on where you’re using the hose. For one, if you’re only using it in small-scale applications, then you won’t need a 100-foot hose. On the contrary, some people deal with larger things such as automobiles. If you’re planning to use an air hose for tires, or for anything outdoors, then it’s better to invest in longer ones. The longest you might find will extend up to 100 feet. However, plenty comes in 50 feet, which is usually more than enough. The power that we’re talking here doesn’t mean tensile strength or durability. Rather, we’re focusing on the pressure of the air that’s being released by the air hose. You can measure the power of the force by pound per square inch or PSI. PSI is used in a lot of equipment as well. The higher the PSI, the stronger the force. Usually, a good midpoint to consider for a broad range of jobs is 300 PSI. You can use this in industrial and home applications. However, if you’re using it for more fundamental purposes, then it’s important to get the PSI correctly. For example, in diving applications, there’s usually a low-level and high-level use of an air hose. Low-level utilization needs around 290 PSI. That is when you may use the air hose as an oxygen inhaler for the diver. 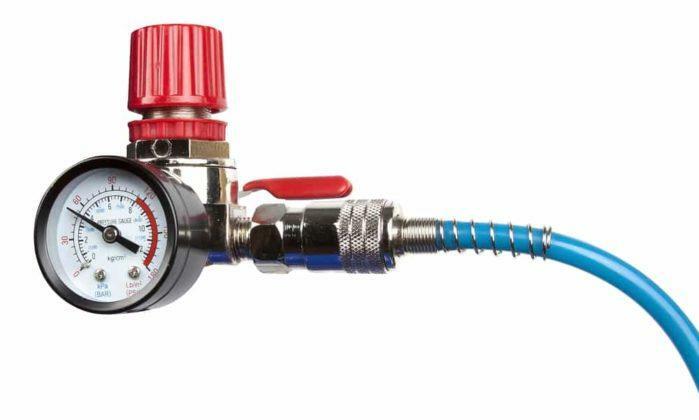 On the other hand, heavy users can reach up to 4.400 PSI and is typically attached to a pressure gauge. Storage is one of the overlooked aspects of buying an air hose. It’s the most problematic because most manufacturers themselves face this problem. So what’s the fuss about storing a simple-looking air hose? Well, simply put, compressed air running inside the tube can make its behavior unstable. Compressed air is stronger than water so that it can overpower the insides of the air hose. Once that happens, many things can go wrong. For example, when you’re using an air hose, you’d want 90 percent of the tube lying flat on the ground. That gives you more control and ease when using it. However, should the hose not take the pressure quickly, and then it will twirl and bend all over like a live snake. The twisting can be problematic not only in use but also in the long run. Excessive coiling can damage the hose over time, both from the inside and outside. It may cause air leaks coming out of your hose. An excellent option to consider is heavy duty bend restrictors that help stop this problem. Some manufacturers even designed their air hose to be in a coiled position. That helps reduce coiling because it is in its spiral form. Amflo’s air hose comes in at a gorgeous blue color that will make it unique whether you’re using it on the sea or land. It’s 300 PSi feature is more than enough to make it an efficient equipment when it comes to small jobs. The Polyurethane material makes it extremely durable, which gives it a lot of edges if you’re considering buying it. It resists changing weathers, climate, and external abrasions thanks to its solidly built construction. Good Year is a well-established brand that’s known for dealing with automotive work. With that said, this company introduces its rubber air hose that’s durable for maximum strength and life-long durability. What you’ll notice immediately with Good Year’s product is its 50-foot air hose that gives you all the freedom you’ll need. Its rubberized body is designed to resist harsh oils that are around in the workshop specifically. Moreover, thanks to its outer coating, it’s completely resistant to harsh solvents as well! The fittings might be a little flexible, which is unnecessary and can cause slight changes in how you use this. Flexzilla air hose boasts an attractive, neon green color which gives this tube more appeal. 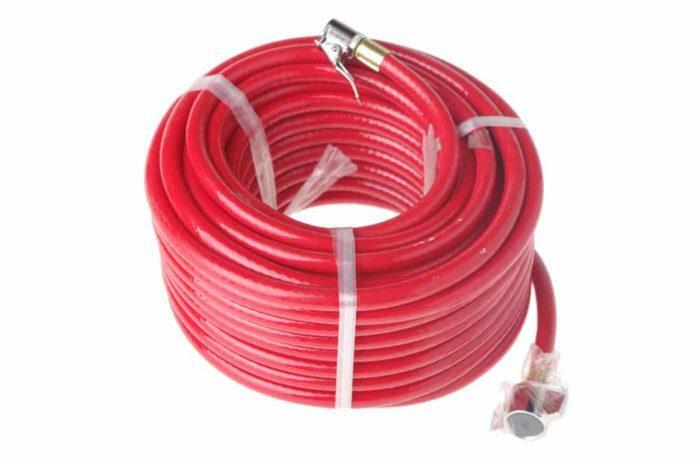 The Flexzilla air hose has dimensions of 50 feet in length and ⅜ inch regarding diameter. These are all above average measurements that get a lot of jobs done efficiently. What’s great about the Flexzilla is that you can choose a variety of sizes if you are still unsatisfied with the dimensions. You can choose up to 12 sizes, with its maximum length reaching to a hundred feet long. The main recoil air hose features great innovation in its 25-foot product. For starters, you’ll see this tube with a nice black sheen to as its outer coating. It reduces the “old-looking” problems that were present in the previous item. The black sheen removes dirt and makes it look brand new, but the real deal here is its coiling mechanism. Unlike free dangling hoses that we reviewed earlier, the stationary position is already in a coiled position. That means that everytime you release pressure on the tube, it reverts by coiling. It prevents any tangling problems! Hitachi is another staple when it comes to industrial equipment such as an air hose. The main selling point of the Hitachi 115155 is that it is extremely lightweight. It boasts a 40 percent lighter weight compared to PVC material, giving you perfect control on the hose. Moreover, Hitachi has treated this air hose with an immense care by incorporating top-notch durability to its material. Because of the long-term equipment, this air hose is designed to be spiral enforced with bend restrictors for durability. When dealing with tools and industrial equipment, we want the best of both worlds. That means we should always be on the lookout for durability and efficiency. When taking these two into account, Hitachi wins thanks to its simple yet robust construction. It’s arguably the least of all the products that curl or get tangled. Although PowRyte also has an innovative product that prevents this project, it gets minus points. The reason for this is due to its 150 PSI rating. With the Hitachi, you get a max 300 PSI along with heavy duty bend restrictors. Remember; always make a wise investment on any industrial equipment. Choose wisely, and let us know what you think in the comments below! Good luck!